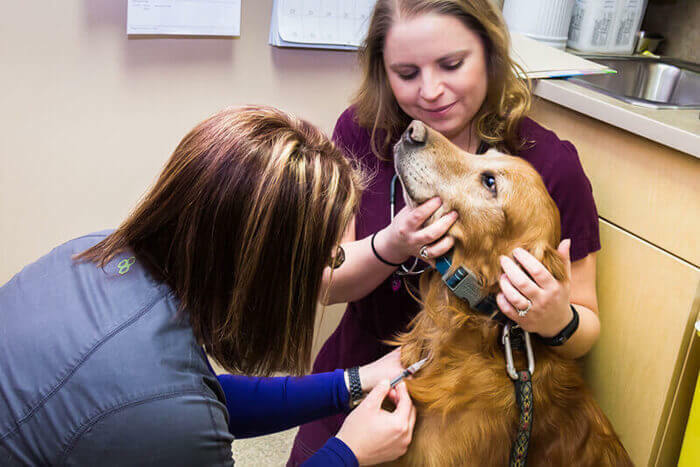 Most veterinary practices offer bloodwork and urinalysis as a part of their routine screening and diagnostic testing. At SCVIM, we also offer bloodwork and urinalysis to evaluate general metabolic function as well as evaluation of the red blood cells and white blood cells and urine. In many instances, additional forms of bloodwork or testing of the urine may be recommended to evaluate more specific problems. The array of blood and urine testing is extensive, and only some of the more common tests are listed below. In some cases other testing may be recommended. Endocrine testing. Blood tests to evaluate function of the adrenal gland, thyroid gland, parathyroid gland, and reproductive organs. Infectious disease testing. Blood samples may be collected to determine if your pet has been infected by bacteria or parasites that may cause disease and illness. Gastrointestinal function testing. Blood samples may be collected to evaluate normal function of the gastrointestinal tract and pancreas. Therapeutic drug monitoring. Blood samples may be recommended to evaluate efficacy or toxicity of drugs used to treat disease.